Wind energy developers face challenges to gain public acceptance and necessary permits because of potential impacts on wildlife, especially birds and bats. As a result, developers may be required to monitor projects for the presence and abundance of both diurnal and nocturnal species, collect data on bird or bat collisions with turbines, and implement mitigation strategies that reduce fatalities, despite the fact that parameters for risk have not been adequately defined. Many of the data gathering requirements are best met with technologies mounted on or near wind turbines that can remotely monitor effects, should they occur. To meet current and future regulatory requirements, project developers need to know which technologies meet the permitting requirements and are cost-effective. Technology solutions are likely to vary by species and specific regulatory requirements and jurisdictions. So a range of technology solutions will be needed to fulfill the needs of wind energy projects. A number of technologies that can detect or deter bird and bat species are commercially available, whereas others are in various stages of development. However, many of these systems have not undergone independent testing and validation, and there is no standard by which comparisons can be made among existing and emerging systems. Convening wildlife statisticians, biologists, and engineers to develop effectiveness testing protocols for emerging avian and bat detection and deterrent technologies. 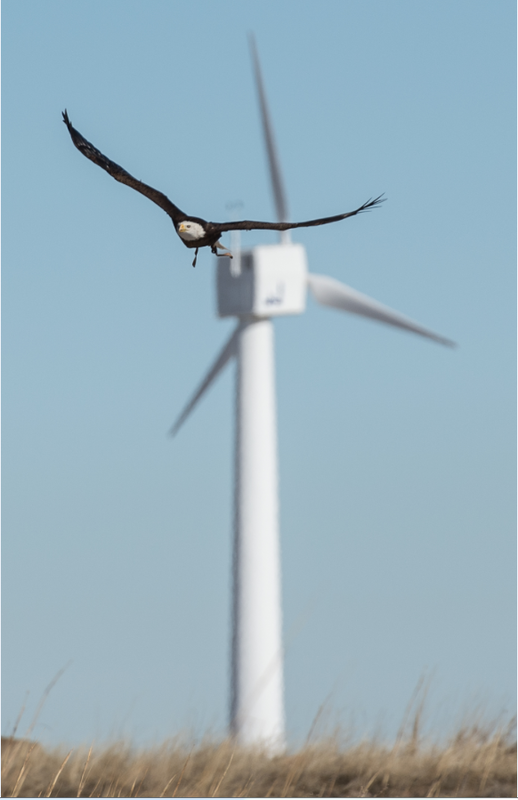 During 2016, NREL hosted two wind energy companies—Laufer Wind and RES Americas—to install and monitor avian detection systems at the NWTC. Both systems are designed to detect bird interactions with turbines to reduce collisions. The 2016 study consisted of outfitting two eagles from Auburn University’s Southeastern Raptor Center with Global Positioning System loggers. To compare the technologies, the eagles were encouraged to cross the two avian detection systems at a variety of angles. The results will allow wind energy developers to better characterize the limits of their detection algorithms and improve analysis methods. The two eagles, Spirit and Nova, are rescues that have been rehabilitated at Auburn University’s Southeastern Raptor Center. The eagles have been trained to fly across a football stadium and land on the field. They do not typically soar like birds do in the wild. Instead, they trade altitude for airspeed and are released from the upper deck of the stadium. To make the most of the eagle flights at the NWTC, birds were released from a man lift, maximizing altitude to, in turn, maximize flight time. Because Laufer Wind uses a radar system to detect aircraft, the data from this study will help them test and validate their equipment for detecting birds. RES Americas developed a stereoscopic, camera-based system to detect and identify flying wildlife, in collaboration with Boulder Imaging, named IdentiFlight. They are also using the data to test and validate their system. Although this experiment was not the first time birds have been hosted at the NWTC to track flight patterns, Project Lead Jason Roadman stated that “This has been the first large-scale field research campaign to collect flight data around wind turbines, and appears to have yielded some really useful data.” He further explained that the NWTC is unique in its ability to support testing of a wide range of technologies designed to reduce bird and bat fatalities at wind energy projects while providing regulatory agencies and developers with a higher level of confidence that mitigation measures will have their desired impacts. Bald eagle Spirit participates in wildlife detection technology testing at the NWTC.